The area largely falls within the ancient ecclesiastical parishes of Llandyrnog, Llangynhafal and Llanbedr the boundaries of which run up at right-angles to the axis the hills from the bottom of the vale to the east. The three ecclesiastical parishes fell on the eastern edge of the commote of Dogfeilyn in the medieval cantref of Dyffryn Clwyd, later to become the medieval lordship of Ruthin, the crest of Clwydian hills at this point having formed the boundary between Dyffryn Clwyd and the cantref of Tegeingl to the north and the cantref of Iâl to the south, and the historic boundary between the counties of Denbighshire and Flintshire. The earliest evidence of human activity in the area appears to be represented by a flint flake of possible Mesolithic date found near Moel Arthur. A number of Bronze Age burial mounds fall within the character area including several in prominent positions on Moel Eithinen, in the upland area to the east and south-east of Moel y Gaer (Llanbedr), and one at the summit of Foel Fenlli hillfort. Other evidence of Bronze Age activity is represented by a group of three early Bronze Age flat axes found in 1962 in a landslip on sloping ground within the southern side of the Moel Arthur hillfort. The dominant sites of archaeological importance are the impressive Iron Age hillforts of Moel Arthur, Moel y Gaer (Llanbedr), and Foel Fenlli which crown the summits of a number of the peaks along the range. The spacing of the hillforts possibly represent different tribal territories which like the later medieval parishes extended across the lower-lying ground of the vale to the west. Roman activity is represented by two hoards of 3rd to 4th-century Roman coins found on Foel Fenlli. One of the major monuments are the remains of the Egyptian-style Jubilee Tower on Moel Famau, built about 1810 to commemorate the fiftieth anniversary of George III's reign, the upper stages of which were blown down in a gale in 1862. 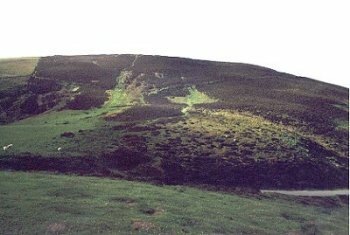 Steep-sided upland, rising from about 180m to a peak of 554m above OD on Moel Famau, the highest mountain on the Clwydian hills, with occasional rock outcrops and screes, with flatter, gently rolling areas along the summit of the hills. Forming part of the Clwydian Range AONB and the Moel Famau Country Park. Much of the area from the public road to the south of Moel Arthur to Bwlch Penbarra to the north of Foel Fenlli is registered common land. The area is clearly defined from the enclosed farmland to the west, the boundary between the two running about along the 180-200 metre contour. The moorland is generally unenclosed, though there are occasional post and wire fences. Land-use is generally formed by rough pasture with heather and bracken, though improved grassland encroached upon the eastern side of the hillfort defences of Foel Fenlli and on Moel Eithinen where areas of grazing are subdivided by post and wire fencing. Extensive areas of heather burning for grassland management. Part of the boundary between the parish boundaries of Llanbedr Dyffryn Clywd and Llanarmon-yn-Iâl to the east of the historic landscape character area on the crest and flanks of Gyrn at the south, Moel Arthur at the north and places in between is marked by a partly dilapidated dry-stone wall, replaced in some areas by modern post and wire fences, the boundary wall running around the western ramparts of Moel Arthur hillfort. The area is physically separated from the similar character area of Moel Llanfair to the south by the pass which takes the main road between Ruthin and Mold and from the similar character area of Penycloddiau to the north by the pass which takes a minor road between Llangwyfan and Nannerch. The steep slopes of Moel Eithinen have some area of old deciduous woodland together with some small coniferous plantings. Small upland ponds and waterlogged areas of potential palaeoenvironmental significance. The area is crossed by a number of footpaths linking settlements in the adjacent valley of the Afon Alun which are likely to be of some antiquity, as well as carrying part of the modern north-south Offa's Dyke Path past the Jubliee Tower. The notable footpaths are between Llangynhafal and Cilcain, between Gellifor and Bryn-y-Castell, and between Hirwaun and Llanferres. Visitor erosion in places along Offa's Dyke and Moel Famau Country Park paths. Industrial activity represented by a quarry and a number of abandoned small-scale mining enterprises on Moel Dywyll, and a small 19th-century gold mine and trials on the eastern side of Moel Arthur and several stone quarries on the western slopes of the hill. For further information please contact the Clwyd-Powys Archaeological Trust at this address, or link to the Countryside Council for Wales' web site at www.ccw.gov.uk.